This German chocolate trifle is the perfect holiday dessert with drizzled caramel, toasted coconut, creamy chocolate pudding and pecans! I love to eat well, but I love my sweets too. When it comes to making desserts, I like to think outside of the box. I am terrible at following dessert recipes to a T because I always want to make changes to make it my own. I like to think of unique ideas and get working in the kitchen. For this German chocolate mini trifle recipe, I thought about how the ingredients could be put together to make something delicious for the holidays but not too indulgent. 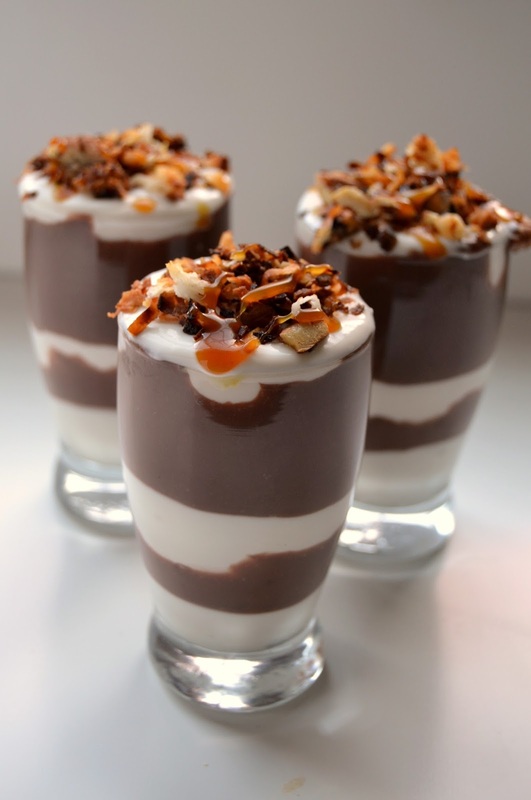 I used a fat-free, sugar-free pudding mix, skim milk and Greek yogurt to make it better-for-you. Don't worry, there is still plenty of sweetness in this recipe but it is not too over-the-top indulgent either. I am 25% German and grew up having German chocolate cake on occasion, I love the coconut, the nuts and the gooeyness but never liked the cake. That is why I swapped out the cake for this chocolate pudding. This dessert is so yummy, you won't even know that it is better-for-you. 1. Prepare pudding according to directions. 2. In a pan, toast coconut until browned- about 2 minutes. Remove from pan and mix 1/2 of coconut in with Greek yogurt. 3. Add pecans to pan and toast for 2-3 minutes. 4. Melt caramel bits the the microwave until runny- can add a bit of milk if it is too thick. 5. 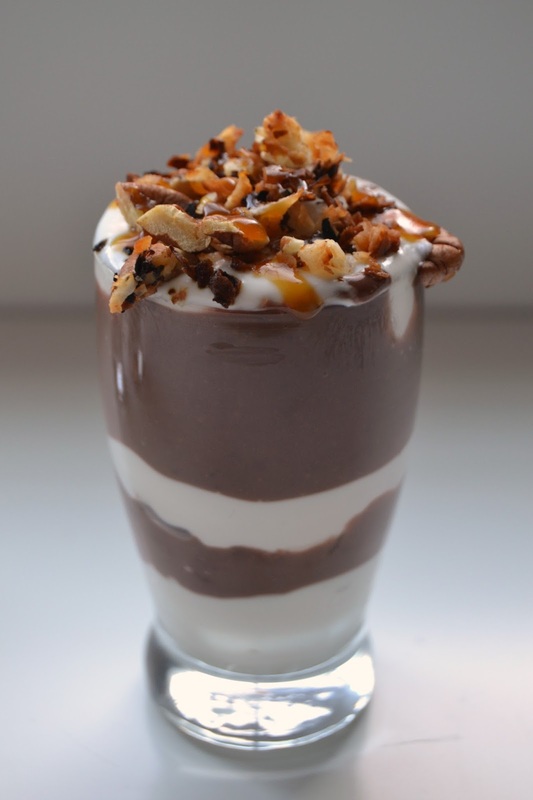 In a glass, layer chocolate pudding, coconut yogurt and pecans until the glass is full. 6. 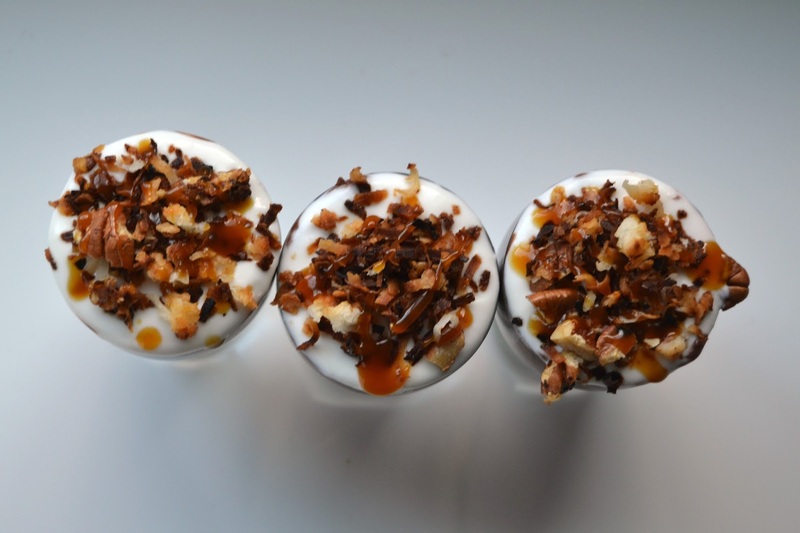 Top with the additional toasted coconut, toasted pecans and a drizzle of caramel sauce. 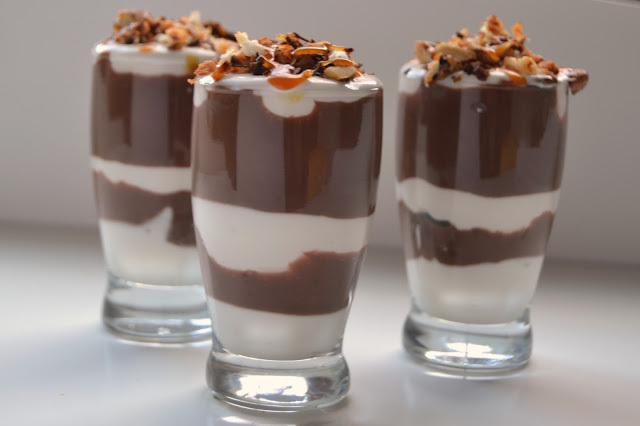 These can be made ahead of time for a party to make serving easy. If you prefer, you could make it all in a large trifle serving dish to make it all together. Just double or triple the recipe to make more. I made these ahead of time and ate one a few hours later and it was perfect. I always like adding pecans to recipes. They add a tasty crunch [client]!